So, I have to be honest. In the past few years, the Motorola brand didn't really wow me. I got behind it when Google had purchased it and I was expecting something really cool. Sure, the X series devices were essentially the epitome of saying you don't need to have top end specs for a great experience, but it just wasn't for me. The Nexus 6 by Moto was also just not something for me. But then I watched the launch today, and I have to say I was pretty wowed by it. Okay a lot wowed. And there was several moments to be wowed by. First off, is it okay if I admit I don't know who Meghan McCarthy? Well, after she bent her phone around her wrist I won't easily forget. Too bad that isn't something they launched today - but look for it in the future. Then there was the unwrapping of the new Tango (notice, it's no longer a 'project') enabled Phab 2 Pro... It was pretty neat, being able to constantly 3D map with the camera and then letting you use AR to play around, or measure (remember, those Intel tablets had that as well, but for only static images after the fact). 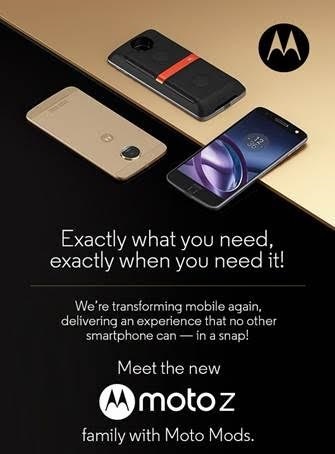 No word on if it was coming to Canada or not tho', so I doubt it'll make it here, so I'll just chat about the Moto Z. So, nothing groundbreaking compared to other flagships out there. But there were a few cool things to add in. First there was the fact that 15 minutes of charging should get you about 50% battery (they say that's about 15 hours worth). That was neat. These pins allow an accessory to be snapped onto the back of the device (held in place by magnets) and then the dots are essential data pins to transfer information. I'll do an article just on the Motomods, as they're called, so I won't go into them here, but I thought this was an amazing way to do these 'mods' and peripherals. It's the new in thing... and we saw how LG incorporated their 'Friends' and even Ashton took potshots about how much easier it was to snap something on the back of the device rather than having to take out the battery. I was blown away, and immediately I started thinking of the items yet to come. But like I said, I'll do another article just on mods, so we'll talk more later. Last but not least, and it was something I overlooked during the launch, but others picked up on: there's no 1/8" headphone jack. 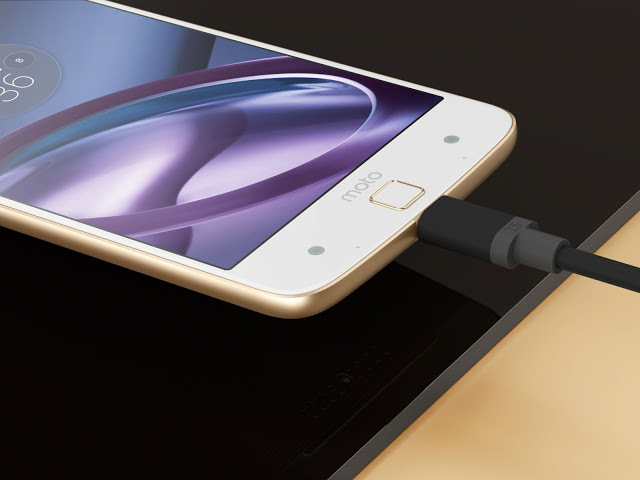 This is going to be only USB-C. Overall, I was very impressed by the Moto device. The Z is a real departure from the X and in all the right directions too. Now, we just have to wait until September to get our hands on it. They also mentioned a Z Force device, but the PR from Moto didn't mention it, so it's assumed it's not coming to Canada (I think I heard them say it was a Verizon exclusive).